With a $100,000 taxpayer investment, the city of Arnold has joined the office space business by jumping on to the trendy “co-working space” bandwagon with Corridor55. These establishments allow one to rent a place to work at lower cost and lower commitment than renting one’s own office. They also offer networking possibilities with other renters. Generally, these are seen as places for hot startup internet ventures to operate, but Arnold (probably wisely) is focusing on accountant and lawyer types to fill the desks of Corridor 55, according Mary Elizabeth Coleman, the council member who spearheaded this effort, as reported in the July 24 Leader. One of the fruits of Arnold’s $8,000 investment in news/advertising with KMOV (Channel 4) was this puff piece on the new facility, which ran in mid-September. 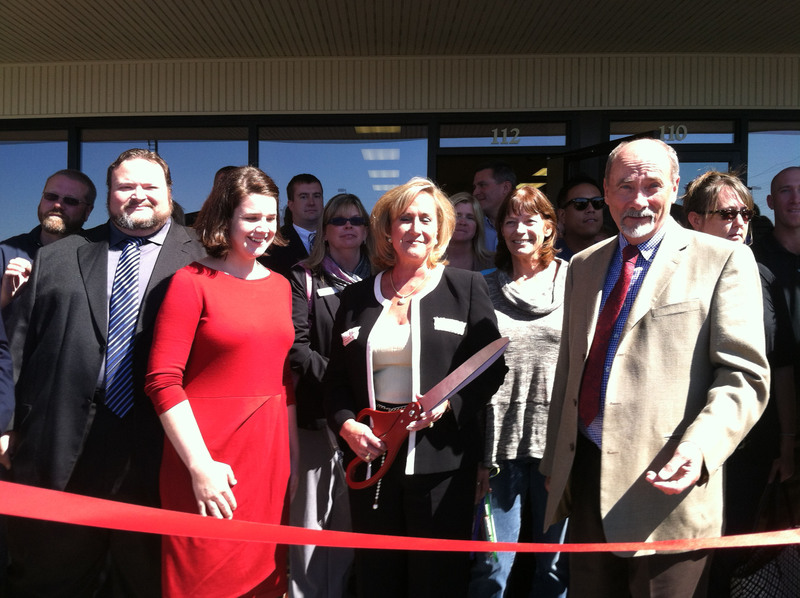 I was also honored to cut the ribbon at the dedication ceremony for Corridor55 in Arnold this week. Corridor55 is the first municipally owned co-working space and business center in Missouri. This innovative facility will be a catalyst for small business growth in our community, creating jobs and expanding our economy. I congratulate Mayor Counts, the Arnold City Council and the Arnold Chamber of Commerce for their vision and commitment to fostering small business. Rep. Ann Wagner at Corridor55 ribbon-cutting. Also pictured: Council members Paul Freese, Jason Fulbright and Mary Elizabeth Coleman, Mayor Ron Counts. If anything, this venture is displacing a local entrepreneur who might want to start such a business. Of course, the fact that nobody has done so may suggest that this project may not be viable in a place like Arnold. Another negative omen for Corridor55 is that it is located in a strip mall (behind the Culver’s there on Richardson Road) that is loaded with empty storefronts – at least 10, by my count. So now the city is competing against local business in the real estate/office space market. This enterprise has run into some resistance. Two council members, Gary Plunk and Butch Cooley, voted against it. They thought the city had better uses for that $100,000. And in August, when the city’s bleak budget picture was revealed, at least one city employee stood up at a council meeting to criticize the appropriation for Corridor55, since employees were facing a pay freeze and increased health care costs (in the end, employees got 2% raises but did face higher out-of-pocket health costs after the city decided to start charging for trash collection). The $100,000 the city spent will pay for a three-year lease (which seems kind of long) and furnishings for the facility. This money was added to the budget from reserve funds in April. At the time, it was slated for generic economic development. Arnold Community Development staffers are managing Corridor55 now, but the city hopes to hire a manager, which would represent an additional cost. Corridor55 pricing is a bit lower than you will find in the city’s private co-working spaces, although the Arnold site does not appear to offer the daily and weekly plans that some other spaces do. Discounts are currently being offered. I’ve got to imagine Mary Elizabeth Coleman of Ward 2 does not like the citizens of Arnold aware that she spear headed the Corridor 55 program that is built with $100,000 plus of tax payers dollars, all the while the city is so broke it’s trying to sell its sewer system. And to add insult to injury, she is setting up her satellite office in this space at YOUR expense! I can hardly believe the audacity of this obvious conflict of interest!